Dawn, Hospital Manager & C.V.T. Dawn is a founding member of the East Valley Animal Clinic staff. She started working at EVAC while she was still a student at the Medical Institute of Minnesota in 1990. She did her internship here and accepted a position as a Certified Veterinary Technician after graduation. Dawn also has a bachelor's degree in Animal Science from the University of Wisconsin at River Falls. She shares an apartment in St Paul with her cross-eyed cat, Jenks. Dawn grew up in LaCrosse, Wisconsin with a variety of animals such as rabbits, horses, cats, and dogs. She enjoys spending time with family and friends, camping, reading, watching Nascar racing, and football (Dawn is a Packer Fan!). "I like the family atmosphere of the clinic and seeing clients and their pets throughout all stages of their life," comments Dawn. Dawn is amazing in that she remembers so much about our clients and their pets. This talent makes her a resource for the rest of the staff when our memories fail us! She is a talented technician whose experience benefits our practice, clients and their pets every day. Erica is a Certified Veterinary Technician who has been at East Valley Animal Clinic since 2002. She was a student intern from the Medical Institute of Minnesota, which is now Argosy University and was hired on when she graduated. Erica has a love for all animals. She has a parrot named Homer, two cats, Simon and Henry and a dog, Toby. Her husband, Kevin and her sons, Colin and Aidan try and happily coexist with her menagerie of pets. When Erica is not taking care of her family and pets, she enjoys gardening and hiking. Ever since Erica had Colin, she has been working at East Valley part time. She is a great team member who is efficient and professional. Erin has been with East Valley Animal Clinic since March 2004. She has worked in the veterinary field since 2000. 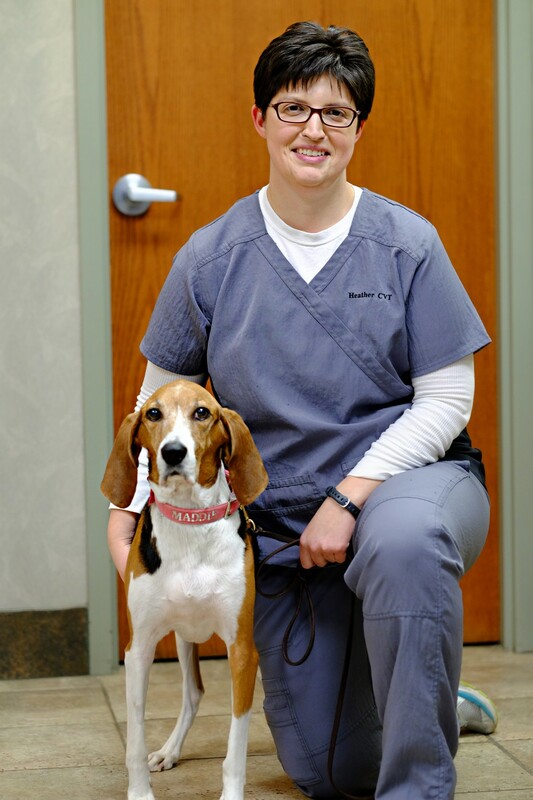 She is a graduate of the Medical Institute of Minnesota and is a Certified Veterinary Technician. Erin drives from White Bear Lake where she shares her home with her husband Tim, 3 kids, Abigail, Mason and Riley and their cat Madison. In her free time, Erin enjoys reading, movies and spending time with her family. Erin brings a special quality to EVAC with a laugh that is loud and infectious. She is also a wonderful, caring, dedicated technician. 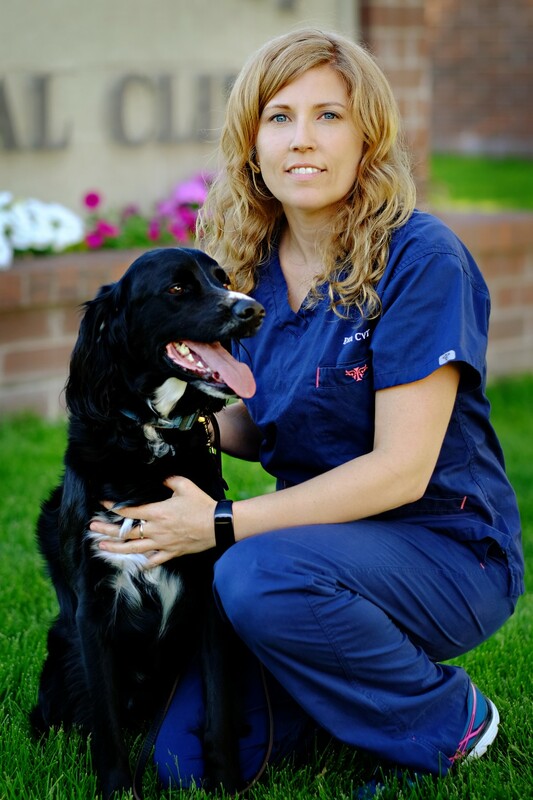 Brigitte is a Certified Veterinary Technician, who has worked at East Valley Animal Clinic since 2004. She is a graduate of Argosy University. Brigitte is married, and she and her husband Nathan have three sons, named Matthew, Isaac and Benjamin. She also shares her home with her dog, Rusty. In her spare time, Brigitte enjoys camping, trips to the BWCA, hiking, scrap booking, and spending time with family and friends. Brigitte brings so much to East Valley Animal Clinic. We lovingly refer to her as "the AAHA police" as she keeps us on task with the strict quality requirements of the American Animal Hospital Association. She also has a strong interest in dog training and animal behavior. She is a tremendous asset to our team. 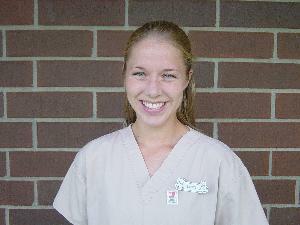 Aimee happily joined the crew of East Valley Animal clinic in April of 2007. She graduated from the Medical Institute of Minnesota, which is now Argosy University in February of 2002. Aimee and her husband, Mike, live in Lakeville with their two daughters Heidi and Hannah. They share their home with Zoey, who is a fun loving, crazy "chug". She is mostly pug but has a smidge of Chihuahua in her. They also have 2 cats named Jack and Jude. Aimee enjoys the many activities that can be done in the great outdoors. Some of her favorite activities include camping, hiking, mountain biking, visiting Minnesota state parks and BWCA. 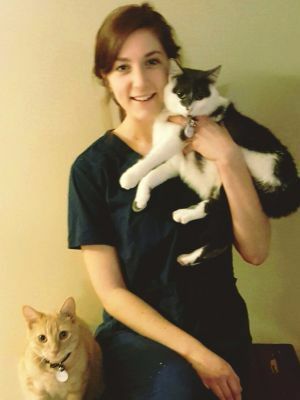 Rebecca is another technician that came to East Valley Animal Clinic to complete her clinical internship from Argosy University and was so impressive that she was hired at the end of her internship. Rebecca has been with us since January 2008. Prior to her education for veterinary technology, Rebecca studied at Augsburg and the University of Minnesota for vocal performance. In her spare time, Rebecca and her husband are busy with their 2 children, and their dog, Rufus. Rebecca enjoys both the Minnesota Orchestra and the St Paul Chamber Orchestra and attends concerts whenever she can. She enjoys hiking on the North Shore, reading and singing. 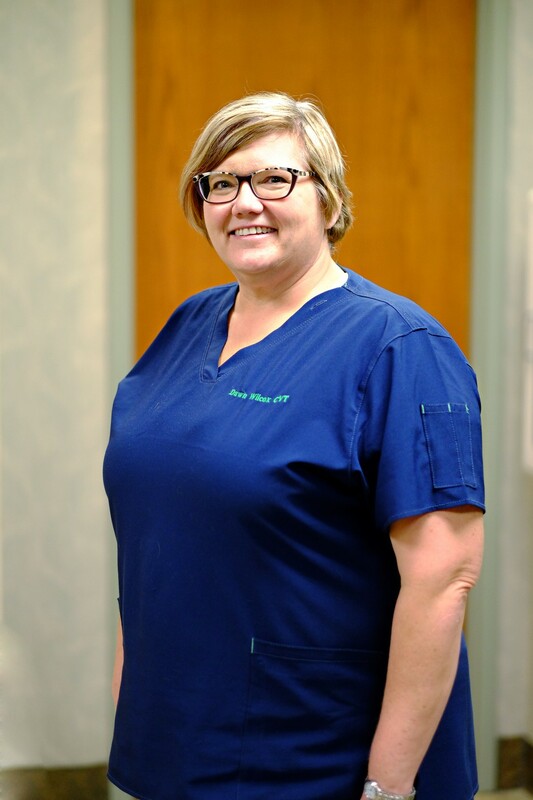 Rebecca loves her job and it shows in the way she cares for her patients. She has a wonderful way with her patients and has excellent technical skills. Melissa joined the staff at East Valley in March of 2010 after completing her internship here. 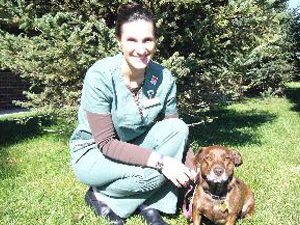 She is a certified veterinary technician and a graduate of Argosy University. Melissa grew up in Rosemount, and now lives in Farmington with her boyfriend, Brent, their sons Noah and Jackson and her cats, Dexter and Mattice. Melissa enjoys reading, watching movies, shopping and spending time with her family. Someday, Melissa would love to add a large dog (or two) to her family and has a soft spot for all bulldogs. Ashlie is a certified technician that joined the staff after completing her internship with us in November of 2012. She graduated from Argosy in February of 2013. Ashlie is an Apple Valley native who currently lives in Lakeville with her husband, Mark, her sons Nixon and Mikko and her crazy cats, Simba and Nala. In her spare time, Ashlie enjoys traveling, shopping, spending time with her family and friends and anything that involves cats. She is living up her title as one of the crazy cat ladies. 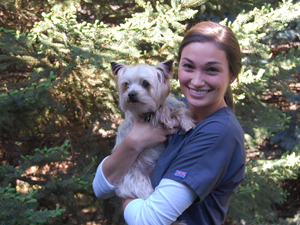 Megan joined East Valley Animal Clinic in the spring of 2014. 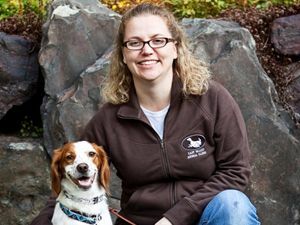 Prior to coming here, she completed 2 years at the University of Minnesota, then graduated from the Minnesota School of Business and became a Certified Veterinary Technician in 2012. 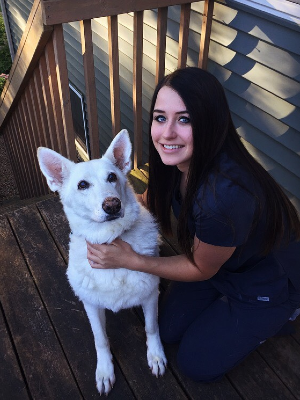 Megan has a very strong interest in dentistry and has completed the course of study offered by the American Society of Veterinary Dental Technicians and is certified as a Veterinary Dental Technician. She enjoys working with both people and their pets and will make you and your pet feel comfortable here. In her fee time, Megan enjoys singing and has a beautiful voice. She also enjoys spending time with her family up at their lake cabin. Her favorite times are spent surrounded by those she loves most-friends and family. She relies on her strong faith to guide her life. She currently shares her home with her husband Grady in Lakeville. 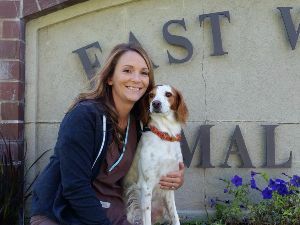 Erika joined East Valley Animal Clinic in 2016. Erika is originally from California, and recently moved to Minnesota from Arizona. Erika has worked in emergency and specialty practices, but is excited to move into general practice. 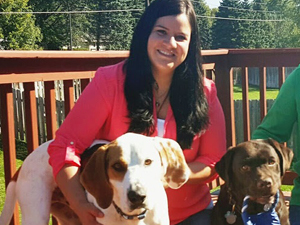 Erika shares her home with her husband and her two dogs, Orson an English lab, and Hogan a hound. In her spare time, she enjoys exploring her new home state, hiking in the state and local parks. She also enjoys painting. Erika is excited to be here in Minnesota, and prefers the weather here compared to Arizona. Let's ask her how she feels after a really cold winter! 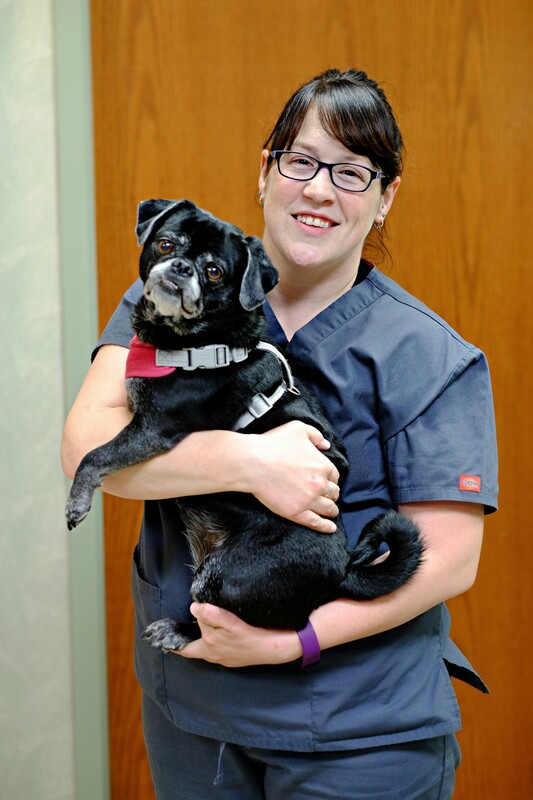 Bobbie is a Certified Veterinary Technician who joined the East Valley Animal Clinic family in January 2008. She graduated from Argosy University in 2007. She came to us from another clinic where she worked for 2 years during her schooling. 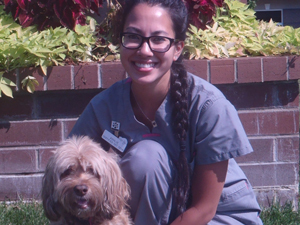 Bobbie completed her internship at the University of Minnesota Veterinary Medical Center. Bobbie lives in Rosemount with her husband, kids and their dogs, Sadie and Bergita and cats Wednesday and Mia Thermopolis. Bobbie and her husband are volunteers with The American Brittany Rescue. They are a designated Senior foster home. In her free time, Bobbie loves spending time with her family, geocaching and watching her kids play sports. Hannah joined East Valley Animal Clinic in August of 2016. Hannah did her internship with us after graduating from Argosy University and we were so happy with her that we decided to keep her. Hannah shares her life with her German Shepherd mix, Parker and her cat, Madison. In her free time she likes to read, shop and go to movies. Sarah is a graduate of Argosy University. 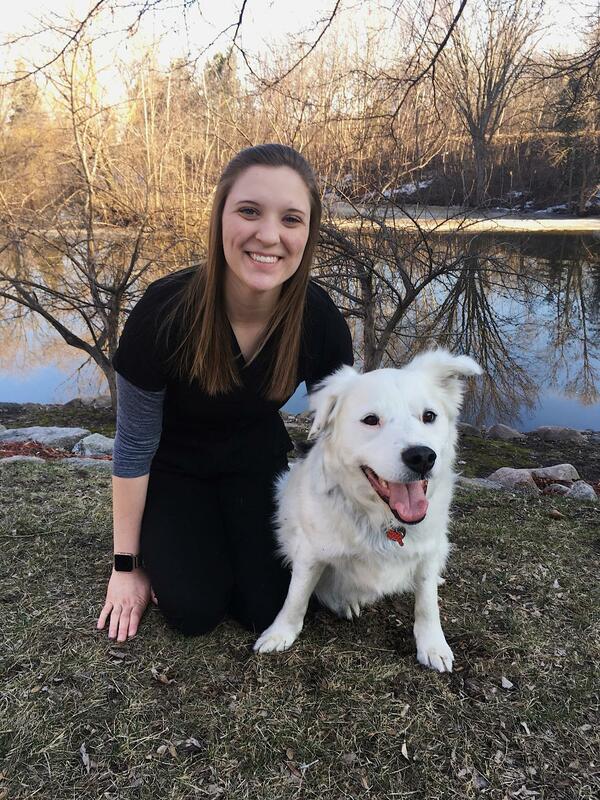 She did her internship at the University of Minnesota, where she gained valuable experience in all aspects of veterinary technology. Sarah has two cats, Leroy Jenkins and Eloise. Eloise was a stray cat found on the streets. She had a tough start, having frostbit ear tips and toes. She now lives a good life with Sarah! In her spare time, Sarah enjoys hiking and loves doing crossfit with her sisters. Emily is a graduate of Argosy University. She was hired here shortly after completing her internship at another clinic. She has been a kennel helper in the past. Emily grew up in the Apple Valley area, and she has been coming to East Valley Animal Clinic with her pets since she was a little girl. She has always loved animals and was always bringing home strays. She still keeps a leash and treats in her car, just in case she comes across an animal that needs rescuing! Emily shares her life with her three dogs, two cats and two horses. She used to barrel race her horses but now just rides for pleasure. In her spare time, she enjoys knitting. 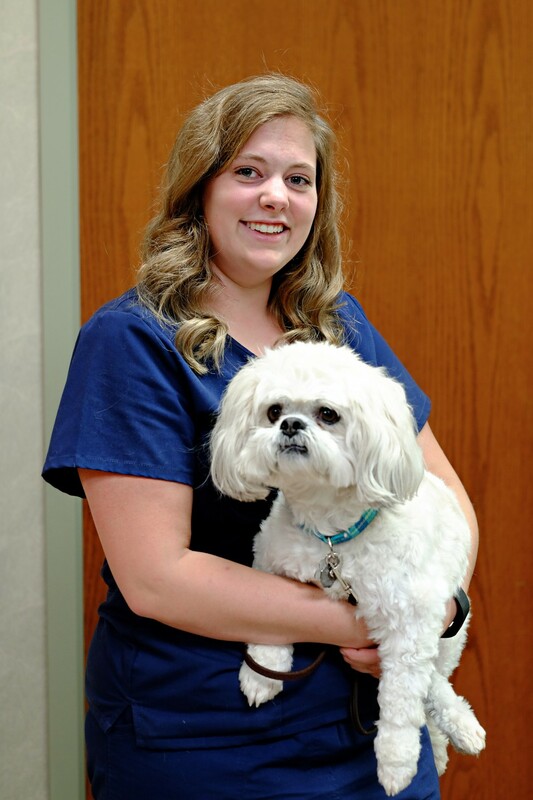 Kaitlin is the newest veterinary technician to East Valley Animal Clinic. Kaitlin recently completed her internship after finishing her studies at Argosy University and we were so impressed with her that we couldn't let her go. Kaitlin has always loved animals, but she started out her education as an art major. She felt something was missing and found herself working at an animal shelter. There, she fell in love with helping animals and decided being a veterinary technician was her passion. In her free time, Kaitlin enjoys hiking with mixed-breed dog, Jace. She is crazy for card games. She can't get enough of them and will happily learn any card games you have to teach her! Jackie has been working at East Valley Animal Clinic since 1995. She is a very talented dog groomer. Beginning spring of 2009, in addition to grooming, she is working at EVAC as a veterinary assistant. Jackie grew up in Bloomington and still lives there with her husband, Tom, and her daughter, Erin. Her furry family includes 1 Labrador Retriever (Roxy), 1 cat (Nala), 2 rabbits (Thumper and Lola), and 1 guinea pig (Chaka). In her free time, Jackie enjoys cooking, gardening, reading, and spending time with her family...furry and human.